The reasons for which I am eternally grateful, and thankful on a daily basis, are too many to count. While I try to always thank the person who holds the door open for me, who helps me with a retreat, or just makes my day better, I have not been as good about expressing thank in the way I do best: with a card. This card was mostly scrap-lifted from a design on Close To My Heart's Creative Insider, plans that help consultants come up with projects for their workshops. I made a few modifications to it -- really, not enough to call my own -- but let's talk about it. 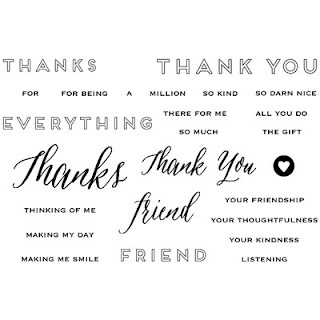 First, using CTMH's "A Thousand Thanks" (C1625) stamp set and Eggplant Exclusive Ink Stamp pad (Z2647), I stamped the words "Thank You" at the top of my cut Daisy White card piece. I used a stamp positioning tool called a "MISTI", which stands for the Most Incredible Stamping Tool Invented. OK, not so humble, but maybe right. It's changed how I stamp and made my life so much easier! 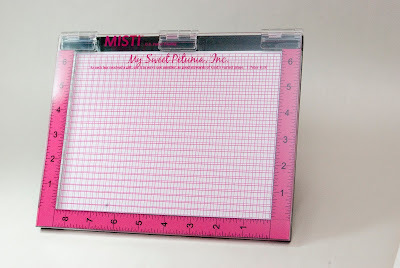 This is what MISTI looks like: It is the size of your Galaxy Samsung Tablet, but it has a magnetic bottom, a layer of foam, positioning grids on the bottom and on the lid. To work a MISTI, you arrange your stamps (stamping side down, or exposed) along the lines of the grid so you can center the lines as well as keep them straight. What I do is put my A2 card onto the MISTI and decide where I want my stamps to be on the card, generally. I put the lid down on top of the stamps, and the lid will left up the acrylic to be generally where you want them. Then you can rearrange them to be straight/centered, etc. You ink up the stamps right on the acrylic lid and fold (hinges) the lid down onto your paper. MISTI is not inexpensive: $50 base price, and you'll need add-ons like magnets, grid paper, and cleaner. You can buy it from the inventor/manufacturer, My Sweet Petunia, at the link provided. Trust me on this one: This is my favorite tool of 2015 so far! 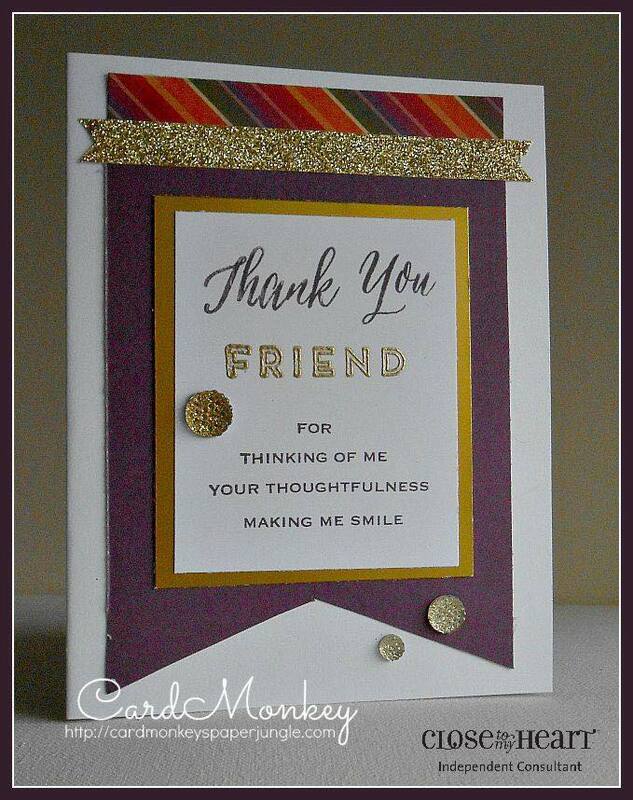 Back to the card: I lined up the 3 sentiments on the MISTI and finished off the white card using Eggplant. Then I decided to stamp the word FRIEND using Versamark (glue) pad, and sprinkled the stamped word with Princess Gold embossing powder. I then heat set the embossed word, waving my warmed CTMH Craft Heater tool about 3/4" above the word until the embossing powder melted to a nice shine. I used Bazzill Gold Foil paper (scrapbook.com) to line the sentiment (white) paper, then layered that atop a banner-trimmed piece of Eggplant paper. I topped the Eggplant piece with a strip of CTMH Sangria paper that I love, and topped that with a piece of CTMH Gold Shimmer trim. The accents are Bling Assortment in Gold from CTMH as well. Voila! Done! Such a sophisticated card, on trend and heartfelt. What a LOVELY card and sentiment.